I just noticed them a few days ago – they kinda hide in all the leaves that the hardneck garlic has sent up over the last two months. 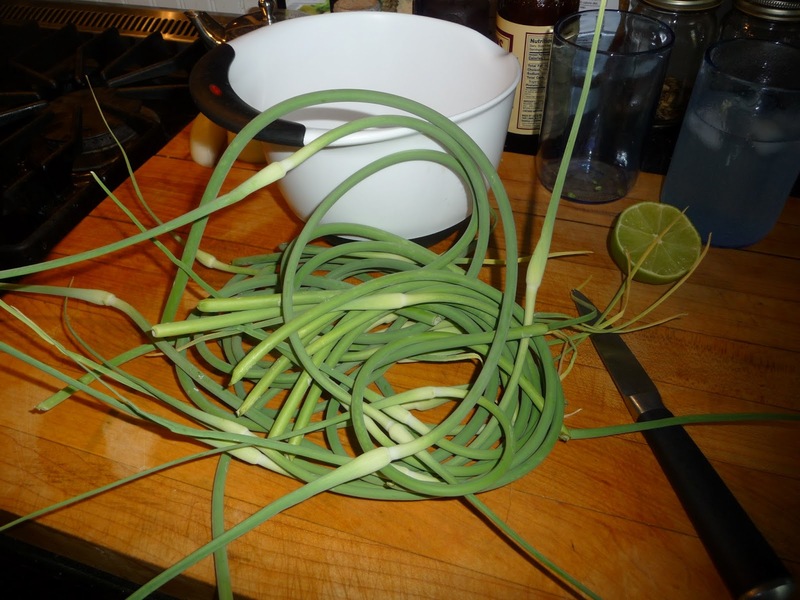 But then I caught sight of one of those green, downward curling stems with its barely-yellow arrow-pointed head and realized: It’s time to cut the garlic scapes. In addition to the cluster of green leaves of virtually all garlic types, hardneck garlic has a bonus that the softneck varieties don’t. Scapes. The scape is the curling green top of the central stem, which is the hard neck. The scape is beautifully edible if you get it before the arrowhead at the tip swells. Left alone, the tip of the scape grows tough and reedy and produces a cluster of tiny little bulbils like teeny onions that can, if planted, eventually become new garlic bulbs in two years, but that project also draws energy off the task at hand: growing big juicy garlic bulbs below. Plus, if you clip off the scape early (as I did last week), at the point of the plant where it just begins to curl, it’s green and crisp, and you can cook it in a variety of ways. Win-win. The scape imparts a garlic-y flavor that’s a lovely addition to omelets, soups or stews. Oil each a little and stick ’em on the grill for a few minutes as we did a few nights ago (I forgot to photo, sorry), or tempura the thing for an hors d’oeuvre. (THAT, I remembered to photo along with the gin and tonics we had with them). Life is good. About a cup of flour, a little salt and enough soda water to make it a slurry about the consistency of crepe batter. I also sometimes use beer for the liquid instead of soda, which adds flavor (the alcohol burns off). Clip off the arrowhead tip, which is reedy, then cut the scapes in half for easier handling. Pour about an inch and a half of oil into an iron pan, an electric fryer or whatever else you have. The oil needs to be 375F as measured on a candy thermometer. If you haven’t got one of those, wait until the oil is very hot before putting several dipped scapes into the oil. * They only take a couple of minutes to cook. Drain them on paper towels. Munch. 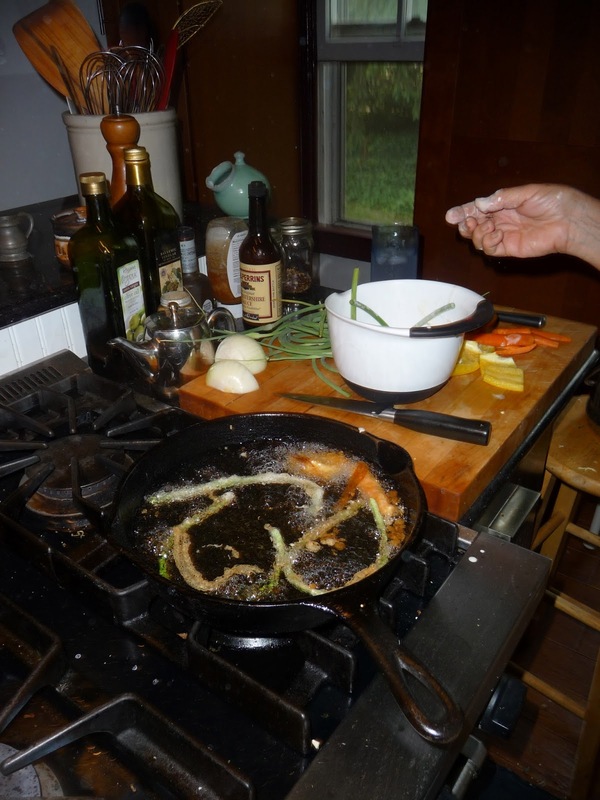 My husband, Gary, who loves fried stuff as much as I do, cut up some carrots and a pepper to tempura as well. Yum yum yum. *Be very careful; the oil can spit, and if you have ANY water on your hands that drops into the pan, it can splatter. (Aloe plants in the kitchen are a help). Just a hint for those people harvesting garlic scapes. You should be able to pinch them off with a thumbnail, if you can't, that portion of the scape is too tough to use when sauteing or frying. This year, I tried something different with some of my scapes, I made pesto out of them which is very tasty. Thanks for the tempura recipe! We got a bunch of these from our CSA. So far, have made pesto which was pretty good. Also, chopped up a few to throw in a quiche. Yum! 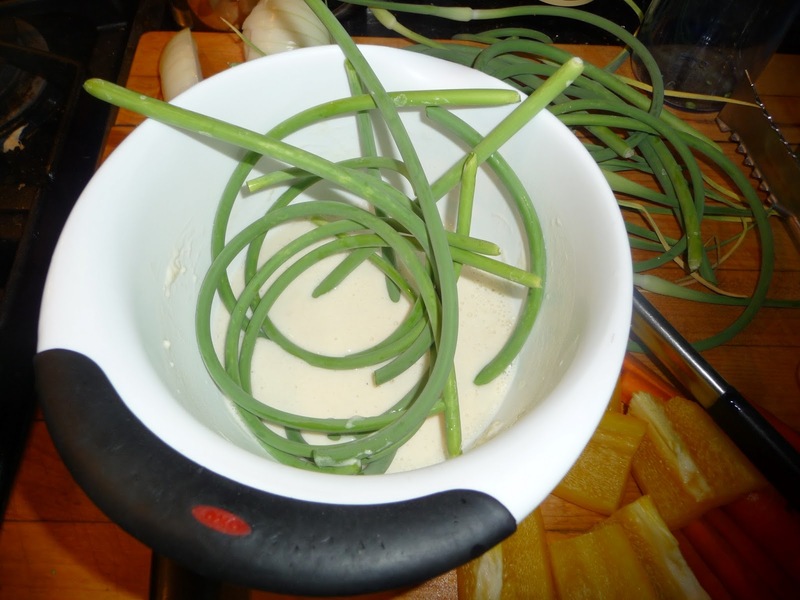 I also have a recipe for a garlic scape + white bean dip I want to try. It would be great if you'd share the garlic scape and white bean dip recipe if you enjoy it — sure sounds interesting. I love dips and tapas and little noshes.